I finally had the time to play with the new PMC clay in the market, PMC Pro. 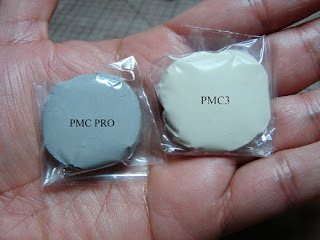 This new clay was introduce to the metal clay community during the PMC Conference 2010 at Perdue. I was one of the people participating in the conference and to be totally honest, I was not curious about this new clay. I saw a lot of people very happy and eager to get the clay as soon as possible, I was not one of them. 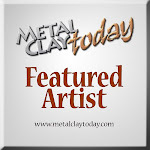 This new clay is an alloy of 90% Silver and 10% Copper. The clay must be fired in activated carbon inside a stainless steel container. PMC Pro shrinks 15-20%. After reading about the experience of working with this clay from wonderful artists like Lora Hart and Catherine Davies Paetz, I decided I have to give this clay a chance. I can not said I do not like something if I have not try it before! So here I am !!! I decided to make a ring, since this clay it is much stronger. 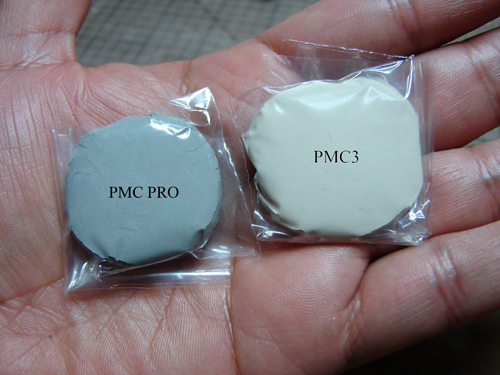 The consistency is different too, the clay does not dry as fast as the other types of PMC. 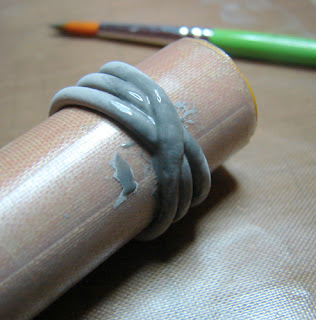 I made a very long coil of clay to start forming my ring, because of the bigger shrinkage factor in this new clay, I went 4 sizes bigger. 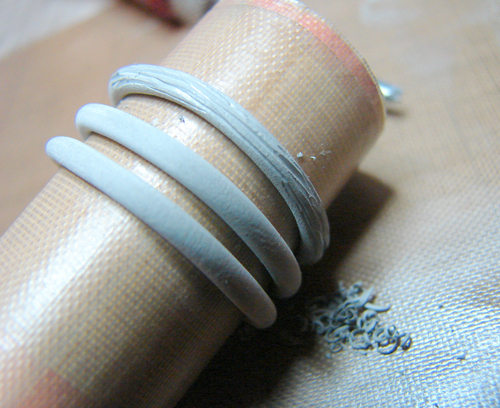 When I made the coil I noticed the clay is not as smooth as PMC3 (this is usually what I use to make my work), it takes more time to make the coil but the clay does not dry as fast as PMC3. I was able to form the ring band with no problems of cracks in the clay. 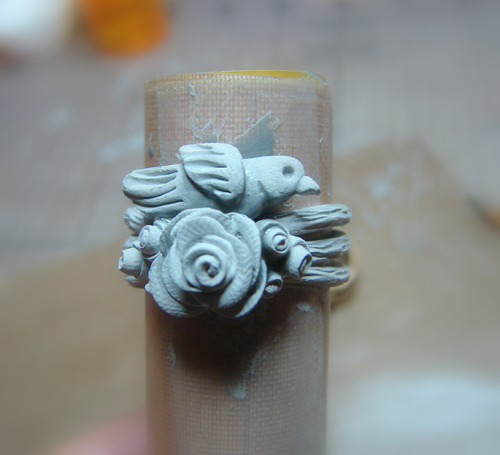 I let the clay dry in my candle warmer to be able to continue with my next step. 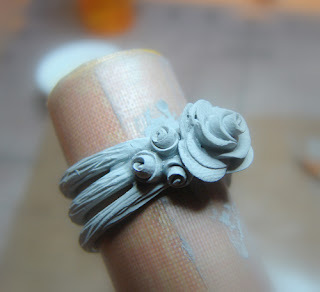 While I was waiting for the band to dry I hand sculpted a rose that I will be adding later in the ring. 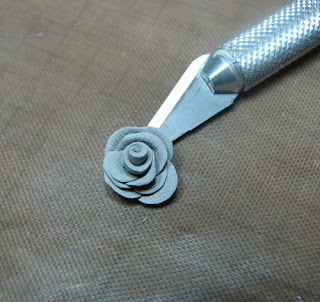 Hand forming the rose was easy, I did not have any problems at all. When the clay was dry I started to carve it, most of my work has carving and I wanted to see how this clay works. I usually carve PMC3 and I really like how easy it is to do it. PMC Pro was also easy, I did notice the clay to be not as soft as PMC3 when I was carving it. 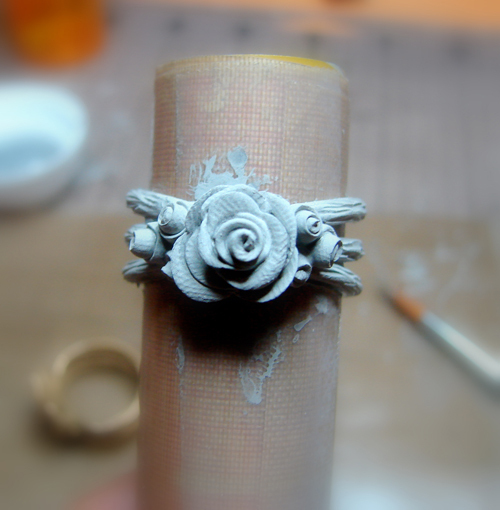 After the carving I added the rose with fresh clay at the bottom and I hand formed little roses and added them fresh into the band. 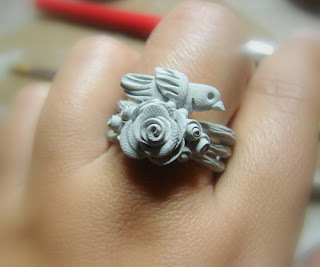 After this I let the ring dry again and I hand sculpted a bird. 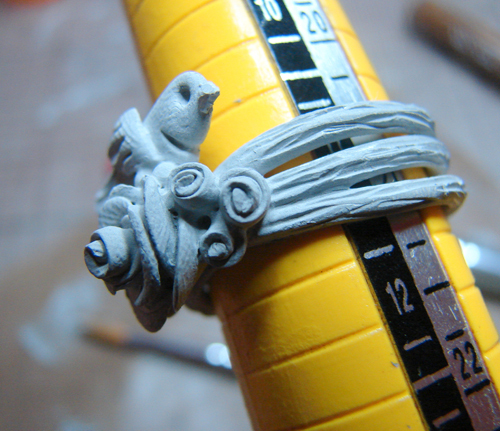 This bird was added to the ring with fresh clay. 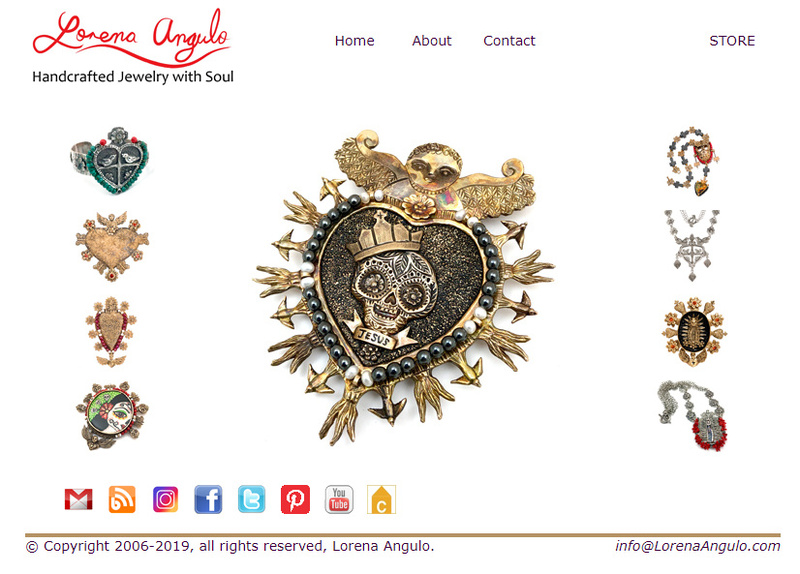 As I mention at the beginning, my ring is 4 sizes bigger. Now my ring is firing in the kiln, full ramp to 1400F and hold for one hour. I will post the finish piece and my conclusion comments Tomorrow. Look forward to seeing the finished ring and the rest of the story. It looks beautiful! 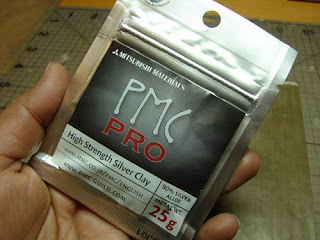 I also am not interested in PMC Pro (specially the extra expense for less silver)... BUT I do like your ring - it's beautiful. Can't wait to see how it turns out. It's looking so beautiful with wonderful detail so I am interested in seeing the end-result!!! This looks like it's going to be beautiful. I'm looking forward to hearing if you think it's worth trying and why. beautiful ring! can't wait to hear the final results. You can see the ring in this post.